As we welcome a new year, we’re also welcoming a new series to our Afternoon Tea line-up; My Family. The series, which ran for 11 years in the U.K., stars Robert Lindsay and Zoë Wanamaker, who head up a fictional middle-class family in Chiswick, London. Lindsay plays Ben Harper, a dentist, and Wanamaker is his wife Susan. Their three children make up the rest of the family and there’s an assortment of sub-characters who I’m sure will keep you in stitches. In order to make room for My Family in the Afternoon Tea schedule, we’ll be “resting” Are You Being Served?, which we hope can return at a later date. Another new show to the MPT schedule is Rick Steves’ Europe, where we’ll be given a guided tour through Mr. Steves’ favorite European cities, villages and off-the-beaten path destinations. The series will air Monday through Friday at 1pm. It replaces the comedies we’ve been airing in that time slot, which under a new contract we have with the BBC, we only have a limited run of. You might also want to check out a brand new British comedy series airing Sunday nights, beginning January 1st at 10pm on MPT2 called Blandings. 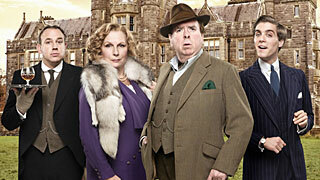 It’s set in 1929 and has been adapted from the Blandings Castle stories of P.G. Wodehouse. Timothy Spall plays Lord Emsworth and Jennifer Saunders is his sister, Connie. Blandings will be followed at 10:30pm on MPT2 by The Detectorists. I hope you enjoy these new shows and you can let me know what you think by dropping me a line.